The Monday Snapshot – S is for STELLA! Then on Sunday after church, we went up to their house to watch the football game, and there my MIL pulled out a pink superhero outfit. Stella is OBSESSED with being a super hero lately (thanks Daniel Tiger), so even though it was supposed to stay at Nana’s house, it came home on her body still last night, was removed only for sleep, and went right back on as soon as she woke up this morning. It’s such a perfect picture 🙂 I, personally, love the wristbands. so much fun watching them get interested in so many new things. Stella looks so happy! That outfit is AMAZEBALLS. I am totally jealous. O.M.G. Where did Nana find that outfit? 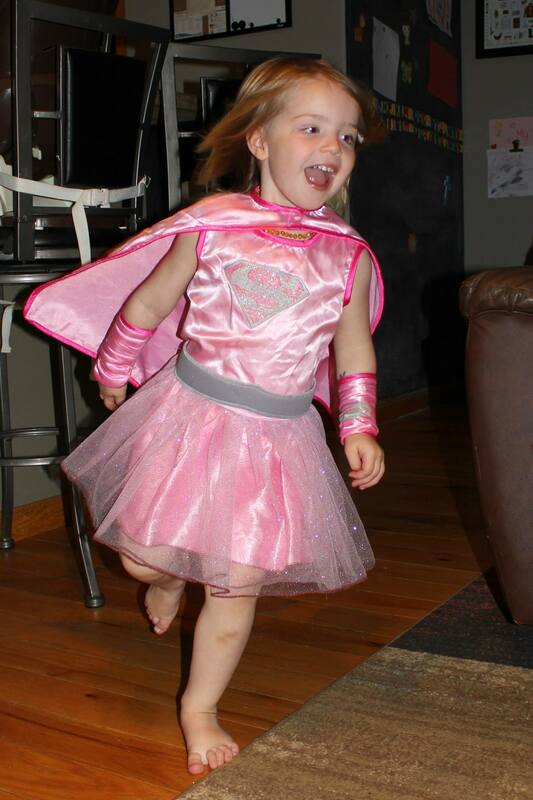 Because I have a little lady who loves, pink, dresses, sparkles and super heroes just as much!! lol, I’m pretty sure it was just a Wal-Mart special!